The new charts can be found in the advanced statistics window, under the ‘Duration’ tab. Looking at the new charts will help you quickly evaluate and characterize the trading system (long terms, intraday, or scalping) and its consistency. Oanda users – please keep in mind the current method of connecting to Oanda accounts will stop working on January 31st (tomorrow) as discussed here: https://blog.myfxbook.com/2011/01/03/oanda-accounts-will-not-be-supported/ To keep using Myfxbook with Oanda accounts, you’ll have to use their MetaTrader platform. 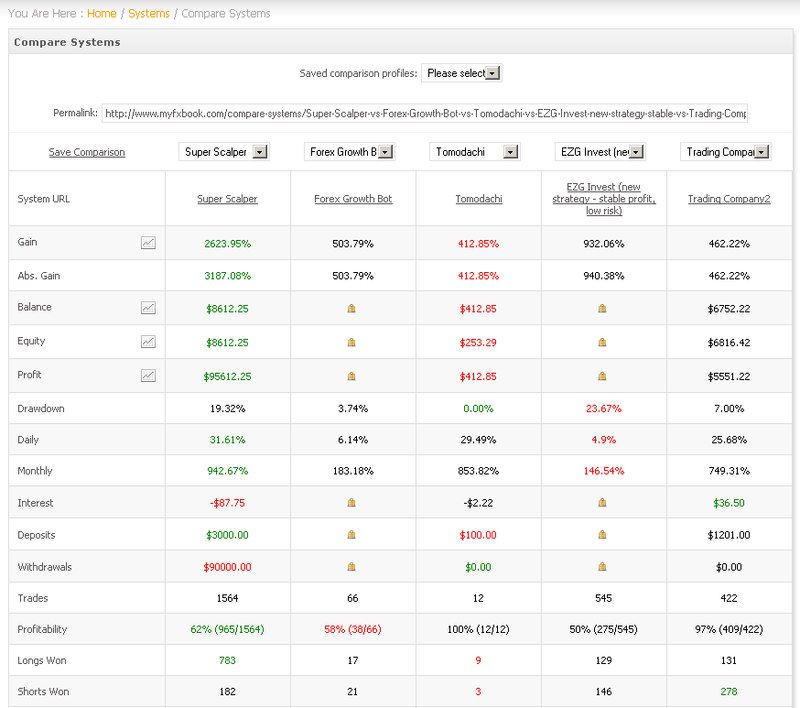 There are thousands of systems connected to Myfxbook, and you’ve probably browsed to several of them to check out the numbers and compare it either to your performance or someone else’s. Up until now there wasn’t an option to compare systems back-to-back, in order to quickly evaluate/compare the systems in question. Well, no you can with the systems comparison page! Compare up to 5 systems simultaneously. Quickly identify the best/worst values for each metric using the in-built coloring (green for best and red for worst). Create and save an unlimited number of your comparison profiles for quick future reference. Use a permalink to share the comparison of your selected systems with others. Compare main metrics in one chart (gain, profit, equity and balance). *The accounts for comparison are based on your watchlist and your private accounts in your portfolio. As some of you might have heard, Oanda are going to release the MetaTrader platform as one of their available platforms for trading – traders who will use the Oanda MetaTrader platform will be able to keep using Myfxbook as usual, so that’s great news! If you have any comments or suggestions about the new section, do let us know! We’re working on more new and exciting sections, so stay tuned! Guys, we’ve been waiting patiently for about a year now to receive an API from Oanda which will allow us to solve the expiring connection issue and remove any existing errors. Unfortunately, we haven’t received it and we’ve also been notified by Oanda that the current method we use to connect to Oanda accounts will stop working on January 31st (due to changes on their side). We apologize for any inconvenience this is causing you, but there’s nothing we can do at this point. Myfxbook will no longer support Oanda accounts starting from January 31st. There is no time frame on when they will complete the API, so any questions regarding this topic, please ask Oanda directly. Update – Oanda will be supported through their MetaTrader platform. You are currently browsing the The Myfxbook Blog blog archives for January, 2011.